Every day of the week, The Pollination Project awards $1000 seed grants to individuals working in areas like sustainability, social justice, community health and wellness, arts and media. Our "pollination philanthropy" model of giving money directly to people, instead of established entities, is intended to help change-makers launch new ideas -- and teachers have unique opportunities to strike at the roots and create a more just, peaceful, healthy future for us all. Last summer, we put out a call to find the 20 most compassionate and innovative social change educators in North America. Winning teachers receive a monetary grant to launch or expand a project, paid tuition in the Institute for Humane Education's six-week home-based course Teaching for a Positive Future, plus professional support from their peers. We believe that these 20 teachers are role models: They are working against the odds to create the kind of just, humane and forward-thinking educational system we all yearn for. Felice Clyne-Davis teaches gifted and talented fifth graders at Edith K. Bergtraum School, a public elementary in Queens, New York. She uses strategies like the Independent Investigation Model and Socratic Seminar to promote critical and high-order thinking. Every year, her class raises thousands of dollars for local and national charities with a musical production showcasing their singing, dancing, acting, instrumental and film talents. Felice is also a volunteer at a feline rescue center. Craig Williams is a math teacher and student advisor at Sunset High School, a continuation high school in Encinitas, California. His students receive critical life lessons about empowerment and tolerance, and a vision for the future that includes the positive and negative impacts a human being can make on the planet. His projects include a school mural representing the diversity of the campus population and innovative ways to interest students in gardening and taking care of the land. 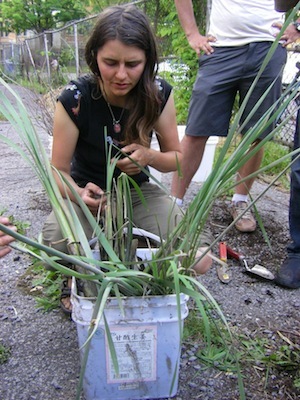 Meghan Kelly teaches ecological gardening in Québec, Canada through Craque-Bitume, a nonprofit urban ecology collective. She teaches students the skills they need to start their own gardens, as well as the skills to question social norms. Her students have worked in community-based projects and are testing homemade potting soils in hopes of finding environmentally friendly alternatives for urban gardeners to use. Connie Wong teaches at the California State University Los Angeles School of Kinesiology and Nutritional Science. Her students learn to serve others through exercise and movement that goes beyond muscles, bones, strength, and balance. Her work teaches humane understanding, openness to being taught by whom we serve and compassionate communication. She supervises students treating impaired or disabled patients and is the faculty advisor of the meditation club. Amy Schulz is an instructor at Feather River College, a community college in Quincy, California, where more than 90 percent are first-generation college students, and more than 80 percent qualify for federal financial aid. Beyond academic basics, Amy teaches real-world entrepreneurial skills, heads a campus social entrepreneurship group and is director of career technical education and economic workforce development. She also started a mentoring program pairing teens in foster care with college students, and last year took students to Southwestern Uganda to complete a water pipeline. Betsy Farrell-Messenger teaches "engineering by design" in science classes at Brown School, an elementary school in Schenectady, New York. Betsy helps her students work out problems and offer solutions based on ethical principles. Her projects include leading students in an effort to eliminate styrofoam from the cafeteria, and an afterschool garden program, where students transformed an old, concrete playground into a "Mindful Garden" for teachers and students to use as a learning space. Dayamudra Dennehy teaches English in San Francisco, but spends a month every year teaching communicative English in Kerala, South India as a means to improve the quality of life in the entire community. She works in the Dalit community, an "untouchable" caste that has faced centuries of oppression and violence, and leads Jai Bhim International, a nonprofit supporting young leaders in Kerala who understand education to be a vehicle for personal change and social justice. Congratulations to our grantees this week for their outstanding work in and outside the classroom. The Pollination Project makes $1000 grants every day, 365 days a year to individual change-makers.